How much does it cost to travel to Uganda? How much money will you need in Uganda? USh178,996 ($48) is the average daily price for traveling in Uganda. The average price of food for one day is USh20,712 ($5.53). The average price of a hotel for a couple is USh261,324 ($70). Additional pricing is in the table below. These average travel prices have been collected from other travelers to help you plan your own travel budget. How much money do I need for Uganda? Located in East Africa, Uganda is bordered by Kenya, South Sudan, the Democratic Republic of the Congo, Rwanda, and Tanzania. The country is known for its very diverse plant and animal life and is most famous as home to the endangered mountain gorilla as well as the endangered common chimpanzee. Foreigners, specifically caucasians, are referred to as muzunga or wazungu in the plural form. This term is commonly called out by children when they see visitors. It is not an insult and a proper response is either to ignore it or respond with a friendly wave. Uganda is not an expensive country to visit, but the facilities are not what you might expect in neighboring Kenya or Tanzania, as tourism is not as common. Your best approach is to relax and go with the flow. Understand that schedules mean little, roads are in poor condition, and part of the experience is to learn to let things go and stay flexible. While most visitors come to the country specifically for a gorilla safari, there are many other things to see in Uganda, so don't limit yourself. Other highlights include wildlife such as the chimpanzees, hiking the Rwenzoris and visiting the source of the Nile River. Uganda's climate is affected by altitude, although the country is equatorial. In general, southern Uganda is wetter throughout the year. On the northern shore of Lake Victoria, most of the rain comes between March and June and November and December. Near the South Sudanese border there is a dry period between November and February. Droughts are not uncommon in the northeastern part of the country and Rwenzori in the southwest is prone to rain year around. Most visitors to Uganda book a car through a tour company. These companies provide a guide and a car, bus or truck. The benefit of having a guide is that they know where to take you and how to get around. This is probably your best option if you want to see a lot in just a couple of weeks. Otherwise you'll spend a lot of time waiting for rides and searching for accommodation. Going it alone allows you to experience a different side of Uganda. You'll get to know the public transportation and see a more local, and arguably more authentic side of the country. In general, if you go it alone, you will travel by a combination of boda-boda, local taxi, bus, and private car within the national parks. Many people in Uganda speak English, although they may not all be fluent. British English is taught in the schools, but Ugandan English is very common. Many people speak with a thick accent that may take you some time to adjust to. There are also many different regional languages spoken in Uganda. Some of the more common include Luganda, which is common in Kampala and Swahili which is spoken in the north and the east. Uganda's national currency is the Ugandan shilling. At bigger hotels and restaurant you may be able to pay in US dollars. It's also possible to pay for bigger activities such as safaris and rafting with US dollars. In fact, most companies require it. Cash is preferred and a 4% fee may be charged if you try to pay with credit card. Also make sure you have enough cash on you, as it is not uncommon for ATMs to close do to a shortage of cash. Plan ahead and assess the situation for each city and town you visit. Accommodation provided by UWA in national parks is generally a good option as the standard is high and the facilities are less expensive. Throughout Uganda you may struggle to find moderately priced hotels. Expensive hotels are of a lower quality than those found in Kenya or Tanzania so you may prefer to stay at a budget hotel and spend your money in other ways. Internet cafes are common in Kampala and Jinja. In the larger towns it's possible to find at least one internet cafe but the connection is usually frustratingly slow and unreliable. It is best to take advantage of the facilities in the largest cities, and then disconnect for the rest of your trip. 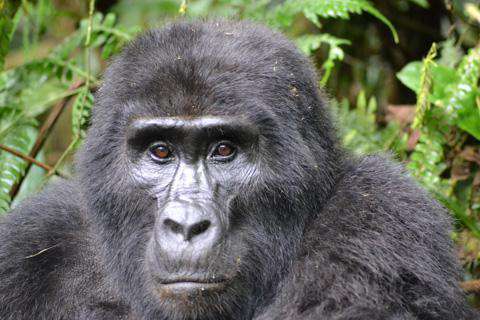 Gorilla Trekking: To go Gorilla Trekking you'll need to buy a permit well in advance. There is limited availability and only a few tourists are taken to the gorillas each day. This is done in an effort to limit the stress put on the animals. If you have a permit, you will have one hour to see the endangered mountain gorillas in their natural habitat. Permits can be purchased through the Uganda Wildlife Authority. Prices continue to rise so you should contact the UWA for the most recent price. Whitewater Rafting on the Nile: Uganda offers adventure travelers world class whitewater rafting on the Nile. You can choose between anything from a half day to 2 day trips. You can also choose your intensity level, from peaceful family trips to grade 5 rapids. Queen Elizabeth National Park: This is Uganda's most visited national park. It is located in western Uganda and covers almost 2,000 square kilometers. It is famous for its wildlife, which was greatly effected by the Uganda-Tanzania War. Many species have now recovered including the hippopotami, elephants, leopards, lions and chimpanzees. Ugandan cuisine has been influenced by English, Arab and Indian cooking. There are regional specialties and many tribes have their own unique dish. In general, dishes include some type of vegetable, potatoes, yams, bananas or another tropical fruit. Common meats are chicken, fish, beef, goat, and mutton, although in rural areas meat is less common. Luwombo: This staple in Uganda is a meat or groundnut sauce that is steamed in banana leaves. It has a strong aroma and is usually served with some form of a carbohydrate. Posho: This is usually made with maize but may be found with other starches. It is cooked with water until it makes a porridge or dough. It is often served with some sort of meat or sauce and is a staple in the country. Whole Fried Fish : This is a delicious meal option that is usually available near the beach. It is typically served with some form of french fries (chips).